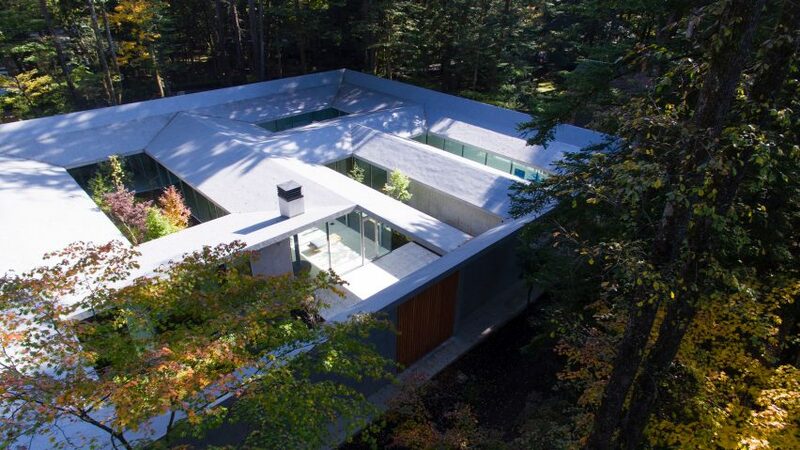 Architects Megumi Matsubara and Hiroi Ariyama arranged this house in the forest near Karuizawa around five courtyards to provide views of vegetation both inside and outside the building. 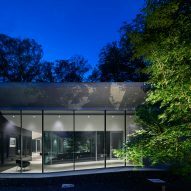 Matsubara teamed up with Ariyama of Tokyo studio Assistant to design the guest house and private gallery for an art collector in Nagano Prefecture. 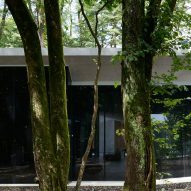 The single-storey residence is situated in a clearing enclosed by dense woodland and nestles up to the existing trees, which cast constantly shifting patterns of light and shadow onto its rectangular roof. 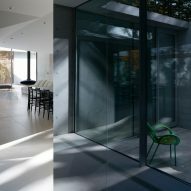 Five large voids carved out of the roof allow daylight to reach the livings spaces through glazed surfaces surrounding the internal courtyards. 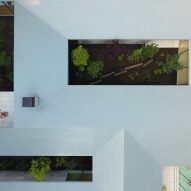 "Its shape being flat and square, the house has a floor plan entirely defined by five courtyards alone," said the architects. "All rooms are designed to face the courtyards, each of which is distinct in character and designed to receive light at different times of the day." 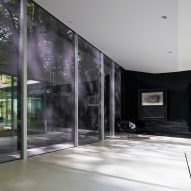 The building's external facades are predominantly formed of exposed concrete, with sections of black glass reflecting the natural surroundings. 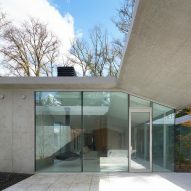 Its reinforced concrete roof features a complex geometry, with sections surrounding the openings sloping inwards to funnel light into the courtyards. The roof's angular form is best appreciated when seen from above, but is also mirrored in the slanted ceilings of the interior. 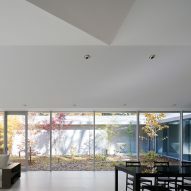 Every room in the house looks onto at least one of the courtyards, three of which contain trees and plants that appear to extend the forest into the centre of the building. 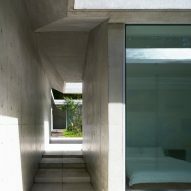 Glazing that lines the courtyards and forms some of the external walls creates a horizontal connection between internal and external spaces. 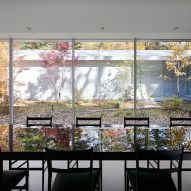 The extensive use of glass also produces reflections that produce a kaleidoscopic effect, enhancing and amplifying the movement of sunlight and the colourful leaves. A simple and neutral material palette applied throughout the interior reinforces the bright and open feel the spaces, while focusing attention on the external views. 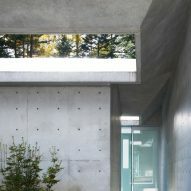 Matsubara and Ariyama previously collaborated on a house close to an ancient Buddhist temple that employs a palette of exposed materials including steel, wood, concrete, glass and corrugated plastic. 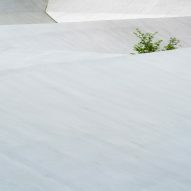 Photograph is by Daici Ano.